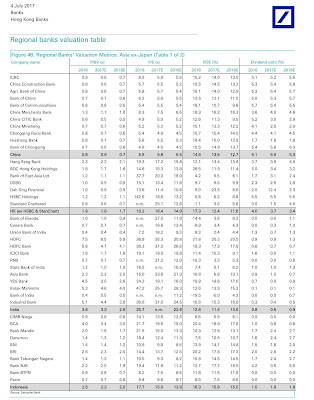 The IMF said China should consider boosting risk-weighted assets at its banks by 0.5% to 1% over the coming 12 months. 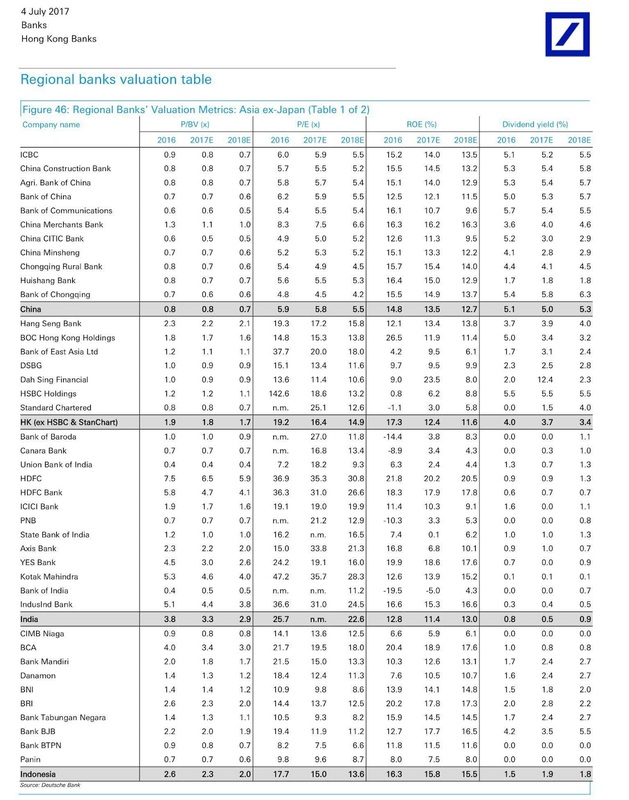 While China’s largest banks are well-capitalized, the IMF said, medium and small banks could face the need to raise even more capital. 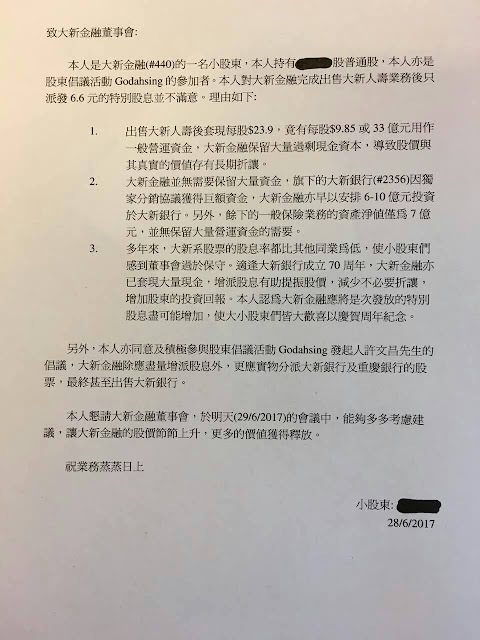 assessments, the VIU may fall below the Carrying Value, in which case an impairment charge may become necessary in the financial results of DSB, DSBG and DSFH as set out above. Shareholders and potential investors are reminded that no decision has yet been made as to whether an impairment charge to the Investment will be necessary, or if so, the quantum of any such impairment charge. Up to and including 30 June 2017, the VIU was still above the Carrying Value. However, in view of the narrowing of the difference between VIU and Carrying Value over time, further information to ensure that shareholders are aware of the accounting treatment as regards the Group’s investment in BOCQ was felt to be relevant information. By 2019 and 2020, Credit Suisse said it planned to distribute 50 per cent of net income primarily through share buybacks or special dividends. “Our strategy is working,” Mr Thiam said. 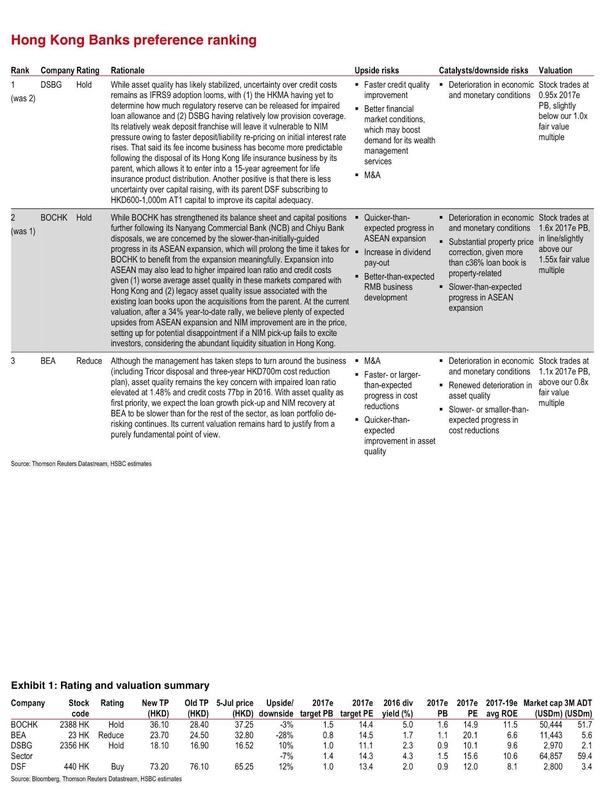 He announced for the first time targets for increasing returns on tangible equity — a common measure of shareholder returns — at 10 to 11 per cent in 2019 and 11 to 12 per cent in 2020. In the first nine months of this year, the figure was 4.1 per cent and in 2016 it was minus 6.9 per cent. A small but top-performing activist hedge fund has set its sights on an ambitious target: breaking up Swiss banking behemoth Credit Suisse Group AG. RBR Capital Advisors AG, which is based close to Lake Zurich and headed by outspoken trader Rudolf Bohli, said Tuesday it wanted the bank to split into an investment bank, a wealth manager and an asset manager. It is unusual for a body like the IMF to identify banks by name. 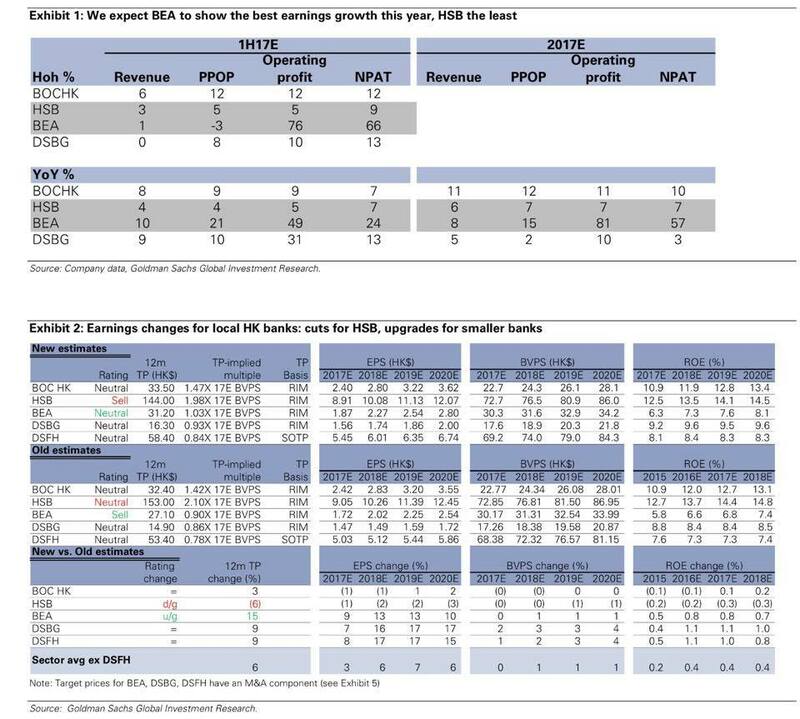 The report named nine financial institutions in all, Besides Citigroup, Deutsche and Barclays, it also named Société Générale , SCGLY 0.13% Italy’s UniCredit UNCFF -0.54% S.p.A., the U.K.’s Standard Chartered STAN -0.30% PLC and Japan’s Sumitomo Mitsui Financial Group , Mizuho Financial Group and Mitsubishi UFJ Financial Group as likely to deliver subpar profits. The IMF said the consensus among private-sector bank-industry analysts was for a return on equity of less than 8% for each of those nine banks in 2019. In previous research, the IMF has said that banks’ cost of equity—that is the return stock investors expect on their holdings—is at least 8%. Banks need to earn above this threshold to remain consistently profitable and otherwise may face difficulty building capital for a rainy day, the IMF said. Shareholder activism is a quintessentially American form of investing. In the U.S., CEOs live in fear of activist hedge funds, and politicians worry about their effects on workers. But the case for shareholder activism is perhaps best seen in Japan, where the corporate sector tends to be structurally skewed in favor of employees, at the expense of shareholders and the economy. In Japan several factors combine to help insulate managers from outside influence, including cross-holdings where the company owns shares in a partner firm, docile boards mostly composed of company executives, and a court system historically biased against investment funds. In Japan the worry lately has not been about too much shareholder activism but about too little. Remarkably, Prime Minister Shinzo Abe has embraced shareholder activism, in a bid to encourage the adoption of his corporate governance reforms, a central part of his economic policy platform. Wednesday’s results mark the first time since the annual tests began in 2011 that all firms passed. That reflects a turning point and could herald a return to precrisis days when banks were reliable dividend payers and shareholders flocked to them. 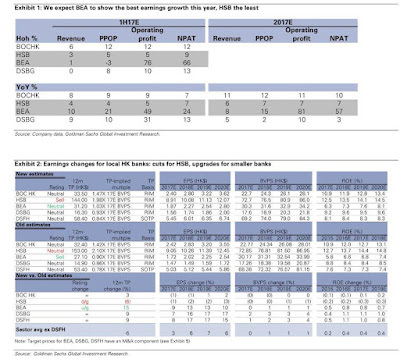 On average, the companies requested payouts that are near 100% of their expected earnings over the next year, up from 65% last year, senior Fed officials said. Alongside the rally of other local banking shares, share prices of the Dah Sing Group’s listed companies have recently edged upward, moving a bit closer to its 52-week-high price seen earlier. 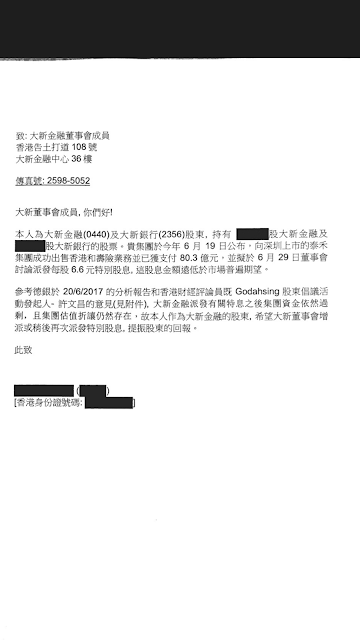 As the founder and activist of Godahsing.com, the website advocating actions beneficial to the Group’s shareholders, I lately attended the Group’s annual general meeting (“AGM”), specifically taking advantage of the opportunity to raise questions, as well as making suggestions to the Group’s top management. 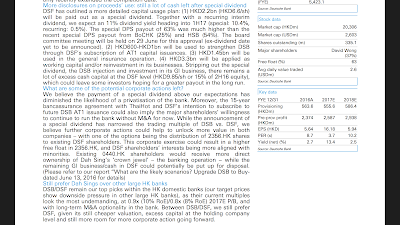 Given the recent changes in the directorships of Dah Sing Banking (2356), although not much publicized, I’m convinced that the time is ripe for a significant upward re-rating, in the valuation of the Dah Sing Group of companies as a whole. Relative to how the Heng Sang Index movement has demonstrated this year, the Group’s share prices may have somewhat underperformed thus far. But now it looks set to be improving all the time. 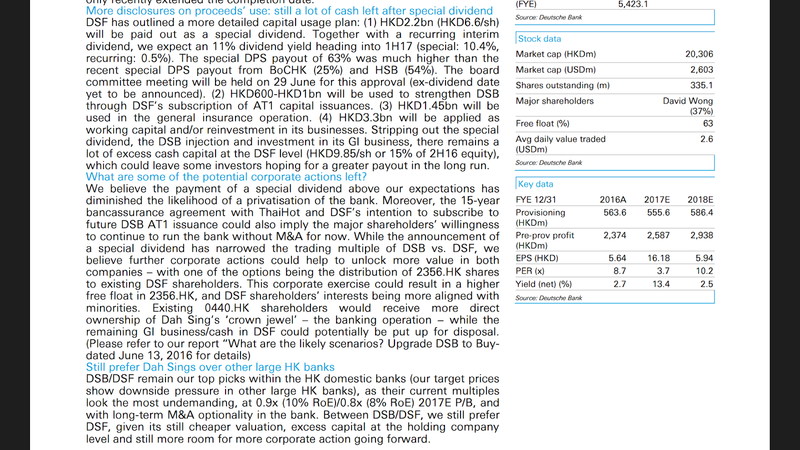 That said, I ‘m glad to have picked Dah Sing Financial (0440), and its subsidiary Dah Sing Banking, as two of my top picks for the Year. 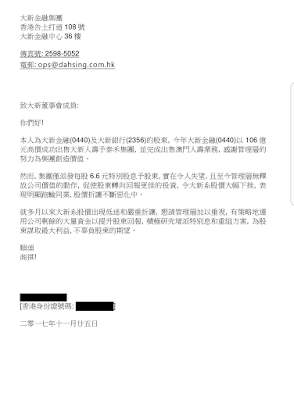 Late May saw Dah Sing Financial announcing a further extension of the “Dah Sing Life disposal” deal-closing deadline (originally set to be on June 2nd). 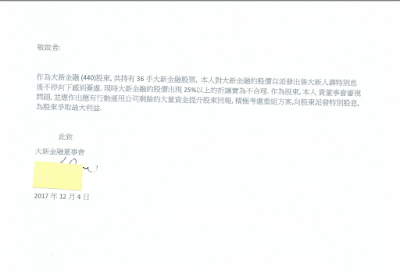 As disclosed, it was the delay in the forex remittance for the deal settlement, that Thaihot Investment, the purchaser, is supposed to come up with way beforehand, that has inevitably caused the extension. 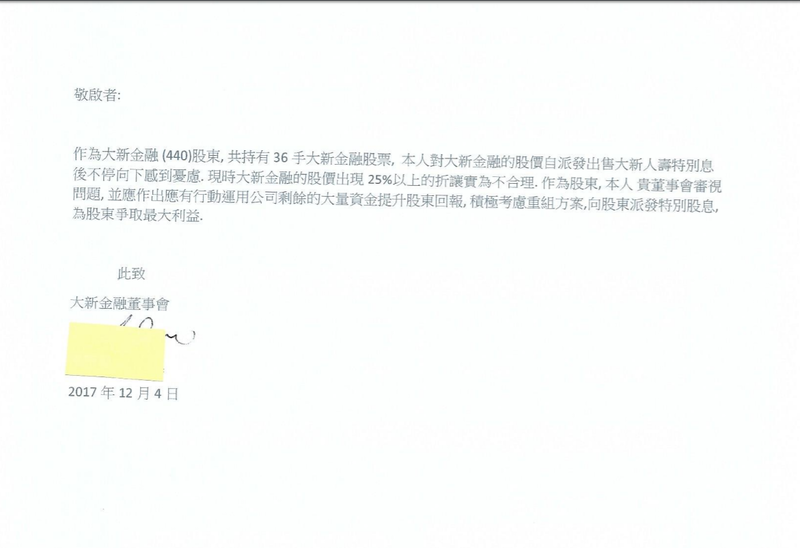 It eventually took as lengthy as nine months to complete the remittance. Hence the relevant approval so deferred. 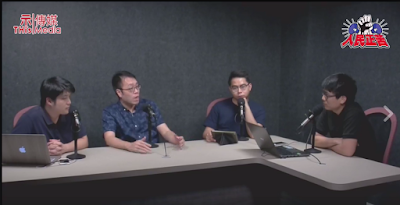 In addition, the transitional change in the oversight authority, from Office of the Commissioner of Insurance, the government agency in charge, to Independent Insurance Authority that took place as recently as June, has also aggravated the matter. Lest we forget, however, such deadline extension is not unexpected by the marketplace. Not to mention that the resulting extension still falls within the 15-month maximum period stipulated, thereby not requiring the another negotiation of, say, a brand new deadline. In essence, the completion of the deal looks set to be just around the corner. The Dah Sing Group AGM was held on 26th of May. 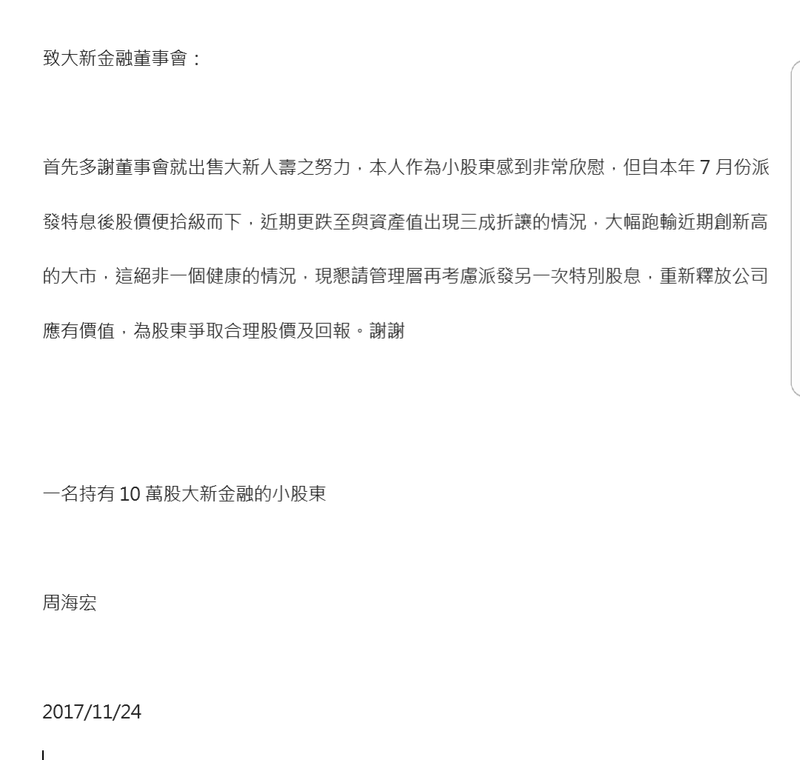 I attended it and came to realize that, Mr. David Shou-Yeh Wong, Chairman of the Group’s Board of Directors, as opposed to his former behavior as a frequent attendee, ended up absent this time. 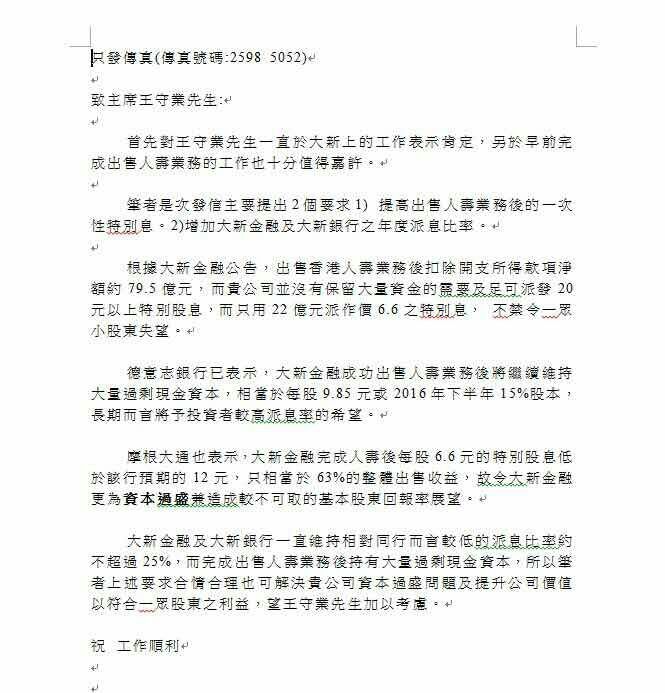 Knowing that the “Dah Sing Life disposal” deal has yet to complete, I chose not to read out any well-prepared open letter on the spot. 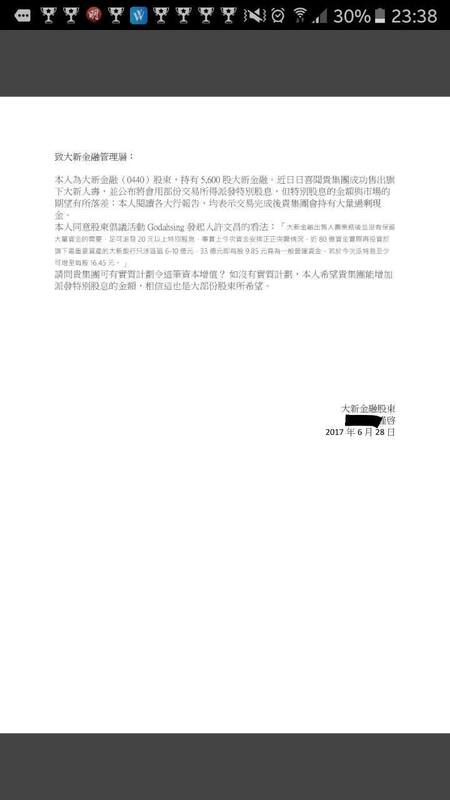 Instead, I reiterated Godahsing.com’s stand point, raising appropriate questions about the deal, and demanding, as before, the management to be committed to delivering a one-time, special cash-dividend distribution. 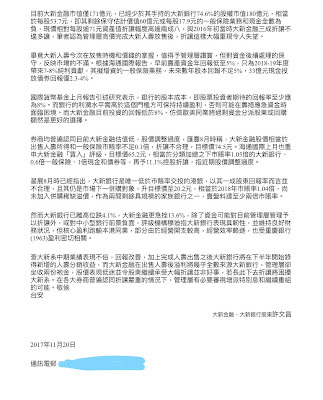 Mr. Harold Tsu-Hing Wong, then executive director of Dah Sing Banking and son of Mr. David Shou-Yeh Wong, replied that both parties remained confident in the forward-looking deal completion. 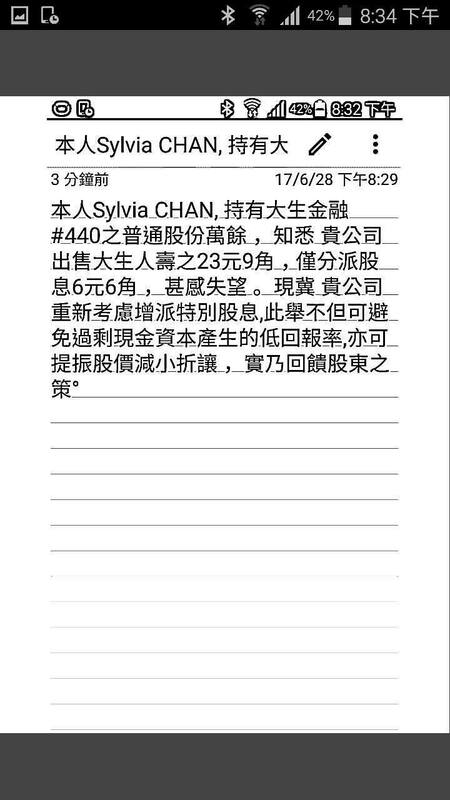 In fact, media of late reported that the purchaser Thaihot Investment had already remitted the money from China. My reliable sources also hinted the same, that the money is at hand. 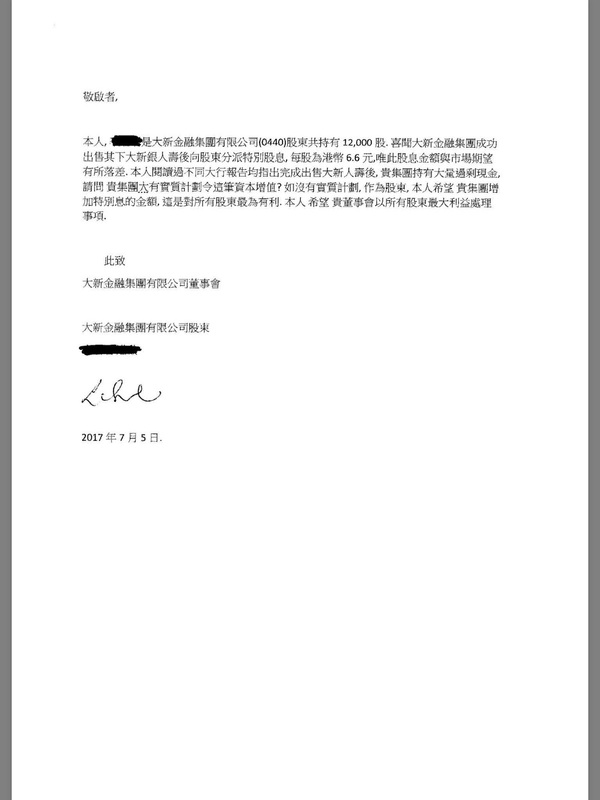 All it matters now is, the deal is due to complete, pending the official approval from the said authority-in-charge. Likewise, special cash-dividend distribution announcement is anticipated to materialize shortly thereafter. 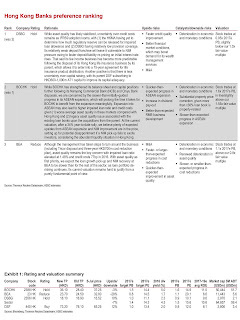 The focus of the matter should then be shifted toward, as to how the eventual Dah Sing Group restructure is going to turn out to, as well as on how it aims to handle their non-core assets, including Dah Sing Banking’s associate, Bank of Chongqing (1963), a mainland China bank, the escalating risk exposure of which is increasingly seen. 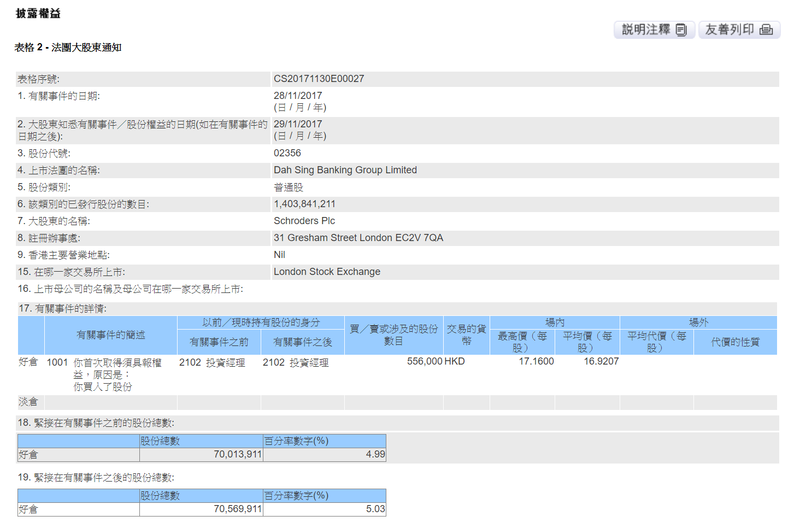 Prior to this, I’ve repeatedly pointed out, that the Group’s holding of the shares in Bank of Chongqing is nothing but one of the negative factors, that stands to drag down the entire share valuation in the Dah Sing Group as a whole. A case in point is as follows. Recently Wheelock (0020) and The Wharf (0004) announced to return to shareholders, all of the proceeds from the sale of i-Cable Communications (1097), in the manner of two-time distribution of dividend in specie. Such an example has established a precedent, for which I’ve hitherto advocated. 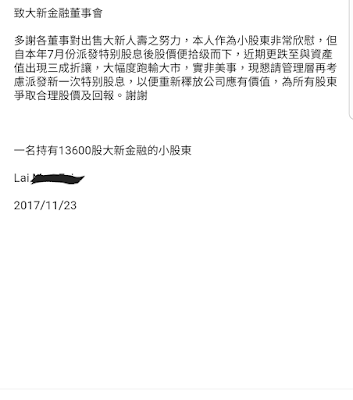 That is to say, disposing of Bank of Chongqing by the Group in a similar manner to the aforesaid, is likely to be a wise solution to the price-dragging problem so caused. As a result, I brought this up during the AGM. 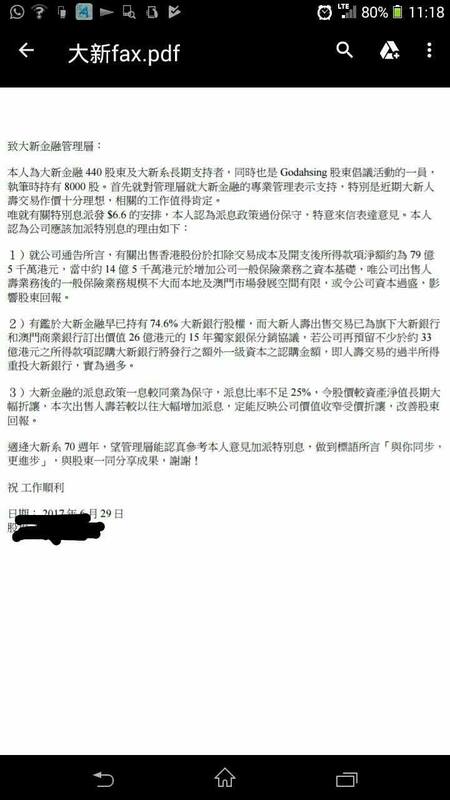 Mr. Gary Pak-Ling Wang, an executive director of Dah Sing Group, responded in greater detail and is worth mentioning. 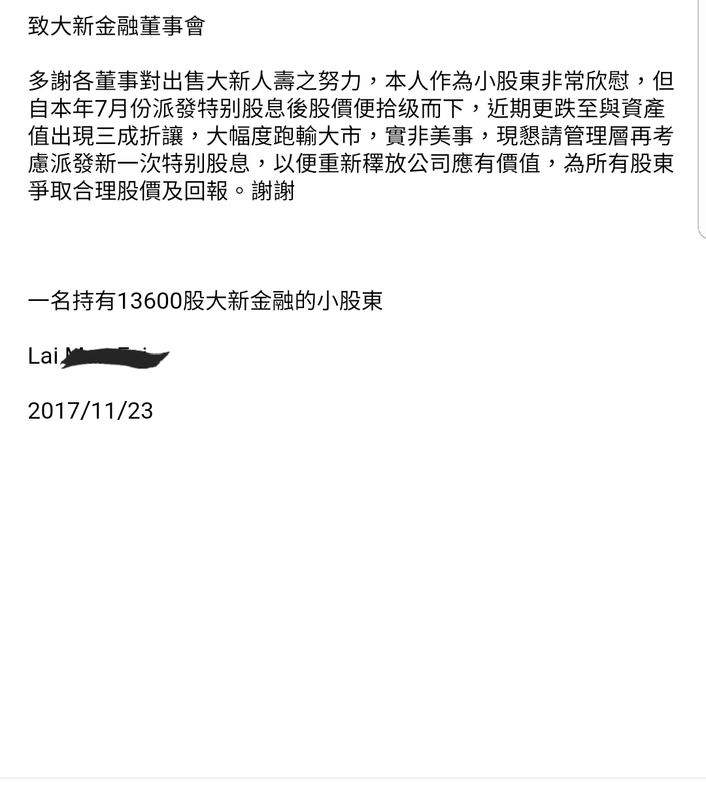 He emphasized that Bank of Chongqing is a long-term investment, and as such, no plans of its disposal and relevant returns of similar proceed in terms of dividend in specie, has been contemplated. I noted that the top management of Dah Sing Group, as a rule of thumb, has been as prudent as it can be. Yet, acting for and on behalf of the stand points of as many as 230 investors in the matter, I reiterated our expectation of a one-time distribution of as few as $20.00 special cash-dividend, from Dah Sing Financial alone, and also our continuous demand for the need to minimize the Group’s risk exposure, specifically in the mainland China market. I was, to a certain extent, satisfied with their responses. After the meeting, however, I was surprised to find out, that as much as 21% of the Dah Sing Financial’s shareholders, although not acting on a concerted effort, had voted against the Group’s general resolution on the allotment issue. Not to mention, that the late announcement of the changes of board directorships that came to light right after the meeting, was, itself, a much bigger surprise. Noteworthy, Dah Sing Financial, the parent company, disclosed after the meeting, that Mr. Nicholas John Mayhew, executive director and head of the subsidiary Dah Sing Bank’s treasury and corporate finance departments, was to be transferred to the listed Dah Sing Banking, to be assuming the positions of executive director and deputy chief executive therein. 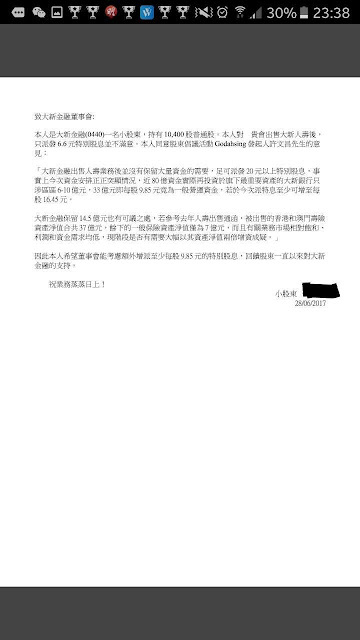 Besides, executive director Mr. Gary Pak-Ling Wang is to be appointed deputy chief executive of Dah Sing Bank, and will assume the responsibilities as the group chief financial and operating officer. 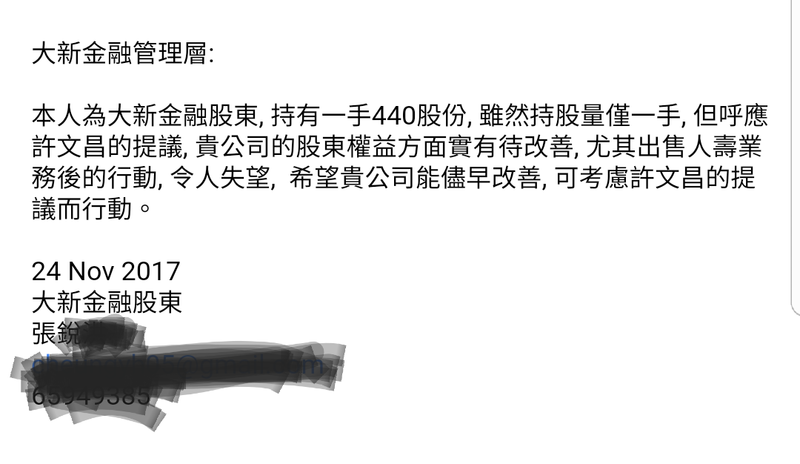 In short, from 1st of June onwards, there will be one executive director less than before, probably a downsizing effort in the anticipation of the sale of Dah Sing Life due to complete soon enough. As matters now stand, there will be three executive directors in the 10-member board. The bank of Tokyo-Mitsubishi UFJ will still have two non-executive directorships. 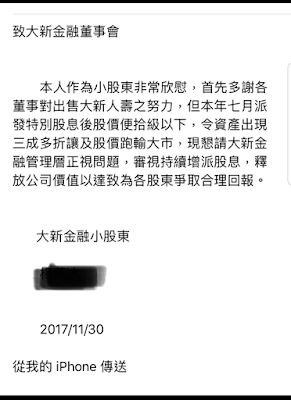 More importantly, in the listed subsidiary, Dah Sing Banking, Mr. Derek Hon-Hing Wong, vice chairman and executive director, will assume the responsibilities of managing director and chief executive as well. 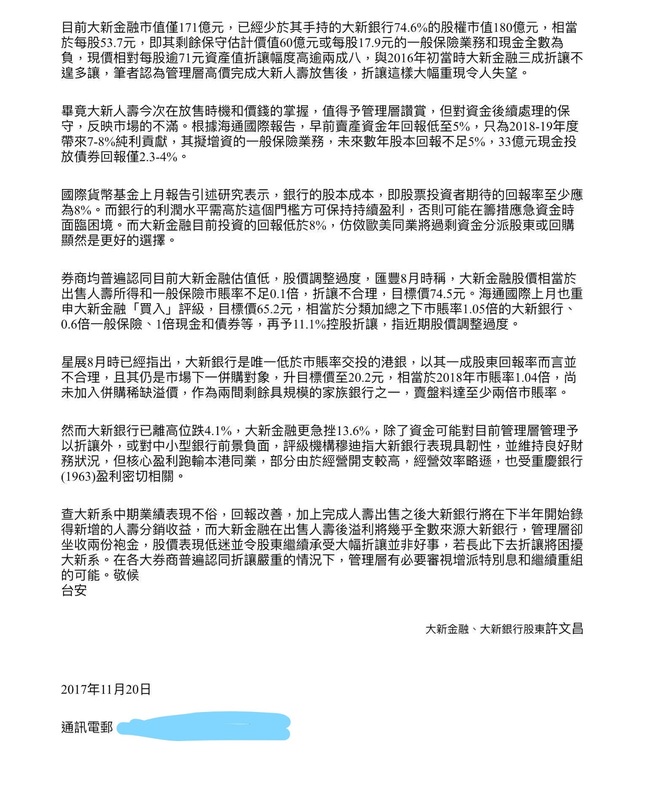 As I pointed out earlier, Mr. Gary Pak-Ling Wang, an executive director in charge of financial matters, will also act as chief financial and operating officer. There will still be four executive directors. Yet there are more surprises. 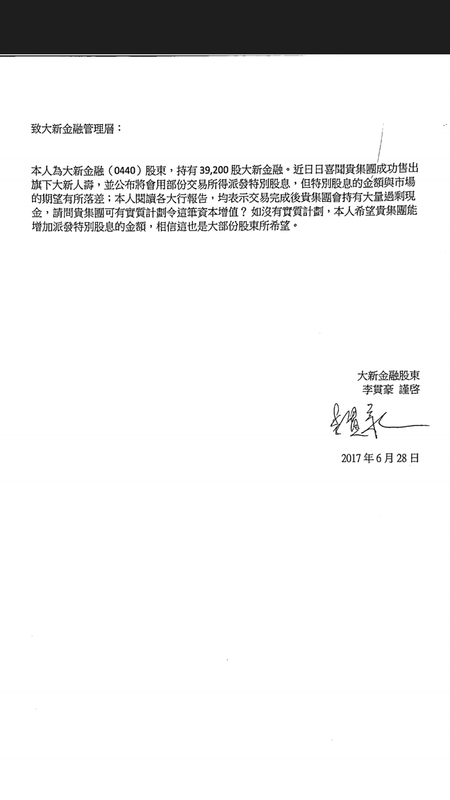 Mr. Harold Tsu-Hing Wong, the heir apparent of the Wong family, will resign from the positions of managing director and chief executive of the listed Dah Sing Banking, and take over what Mr. Gary Pak-Ling Wang left behind, the positions of managing director and chief executive in Dah Sing Bank, the subsidiary. The immediate market response was lukewarm. 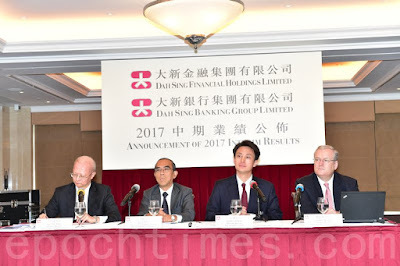 It might have been because of the names of the listed Dah Sing Banking and Dah Sing Bank, the subsidiary, are almost identical, making it hard for investors to distinguish who from who, and therefore what the difference it could have made. 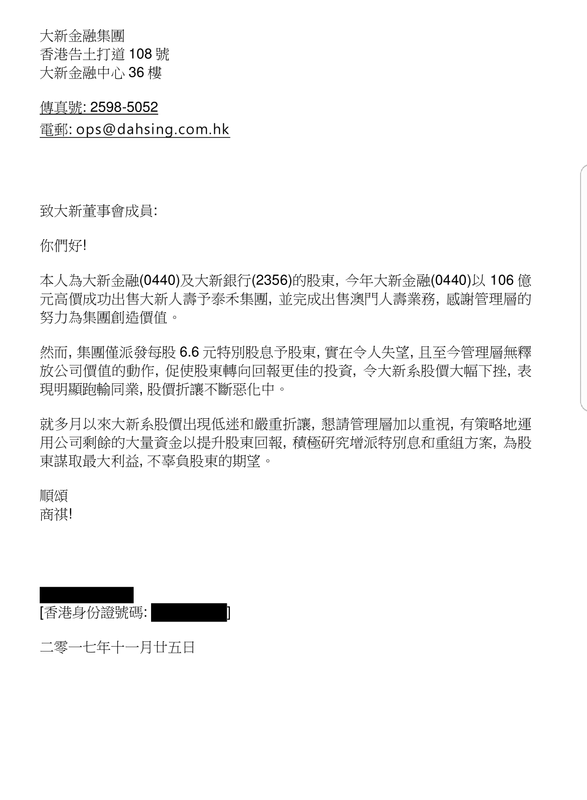 Given that Mr. Harold Tsu-Hing Wong, 47, has already been executive director and vice chairman of Dah Sing Bank for years, the new arrangement cannot be easily understood unless there are mistakes made. 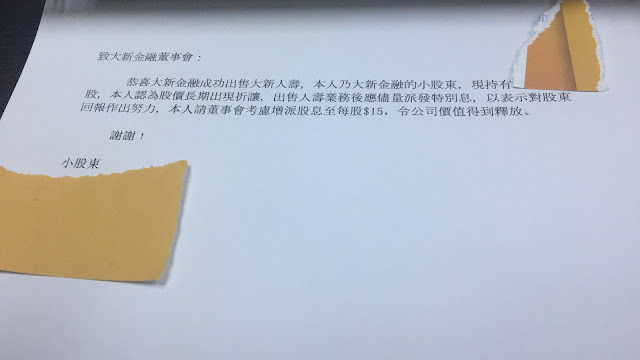 Otherwise, such arrangement is meant to serve only as a preempt action, forewarning the marketplace that it will be him who is to leave the board of the listed company. After all, as and when the 76-year-old chairman Mr. David Shou-Yeh Wong chooses to retire, there will be no more members of the Wong family on the boards of the two listed companies of the Dah Sing Group. Subtly the characteristics of the family business are set to be fading away soon. 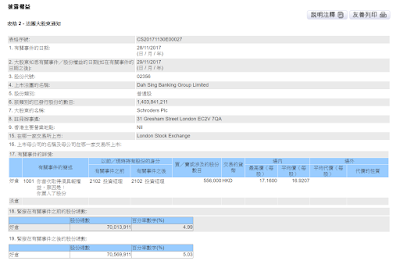 In 1957 businessman Mr. Shih-sing Wong bought the stake in Dah Sing Bank, a bank founded as early as a decade ago, by Mr. Yuan-loong Yang, a friend from his home county. 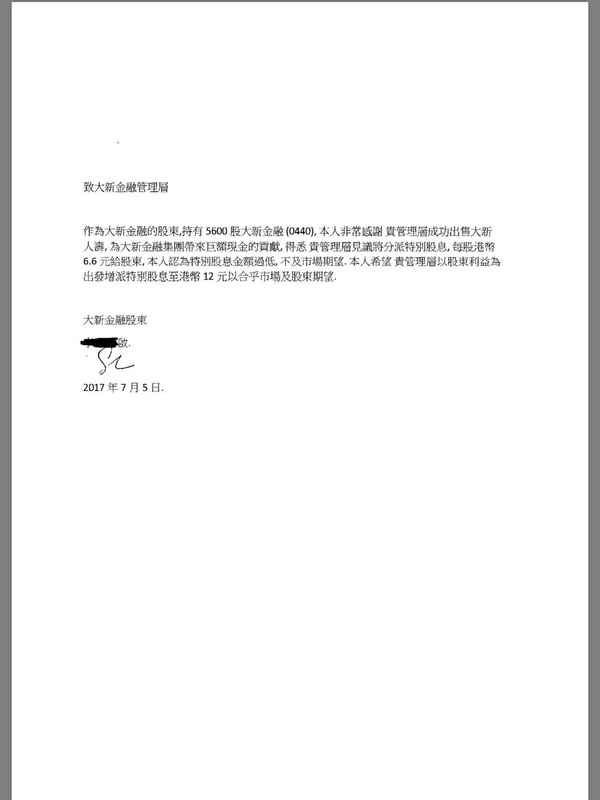 Later on, Wong became the majority shareholder. 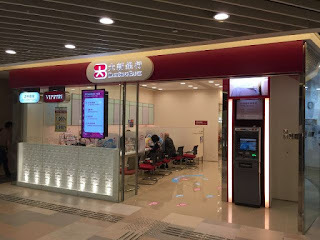 The bank continued to expand under the leadership of three generations of Wongs, Mr. Shih-sing Wong himself, Mr. David Shou-Yeh Wong, his third son and the current chairman, and Mr. Harold Tsu-Hing Wong, the grandson. 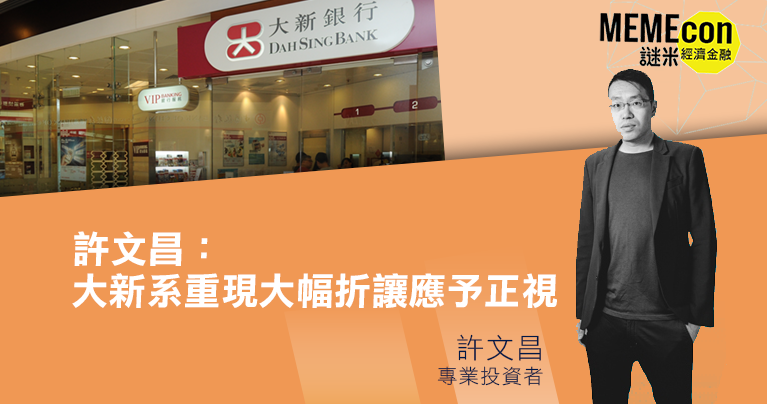 As an independent bank, Dah Sing Bank expanded to the current size almost single-handedly, an achievement that is praiseworthy. 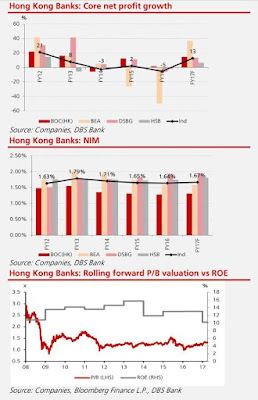 However, compared with the banking peers in Hong Kong who is now enjoying backing from big financial groups, the Group’s status quo shall no longer be in the same league. 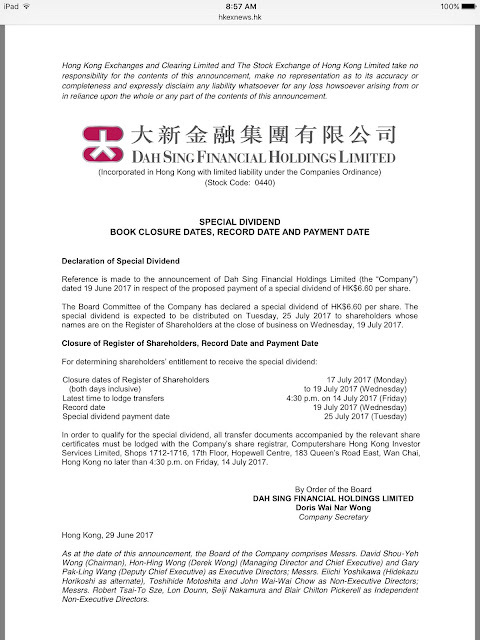 Currently, three executive directors have taken up identical positions in the two listed companies of the Dah Sing Group. A strong indicator of a willingness to stay put. 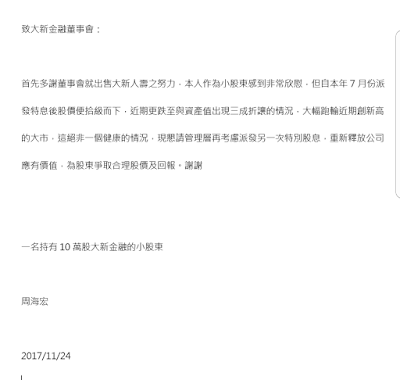 Back in November 2012, Chong Hing Bank (1111), then not yet acquired by Yuexiu Enterprises of Guangzhou, announced that Mr. Lit-Chi Liu, son of the founding father, was to resign as chief executive officer, and Mr. Andrew Liu, the heir of the family in the third generation, was to step down from the management at the same time. This news pushed the share price of the bank, jumping by more than 25% in just two short days. The bank finally changed hand in October 2013. Supported by the new China-owned parent group, the business of the bank expanded handsomely, with revenue doubled in just three years’ time. 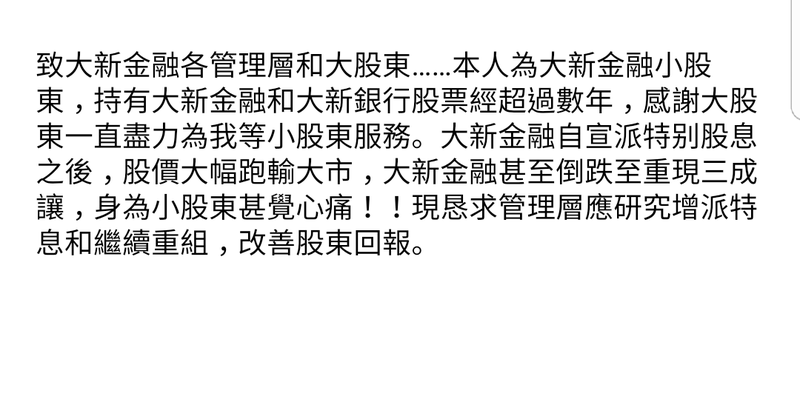 In short, following closely the former footsteps of its peers is set to be a logical step for Dah Sing Group. 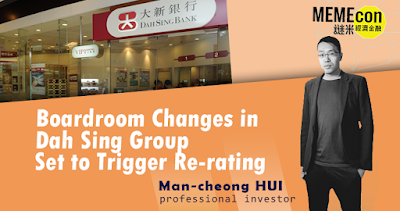 The boardroom changes, so far under-analyzed by the media, can be a trigger for re-rating in its share prices. 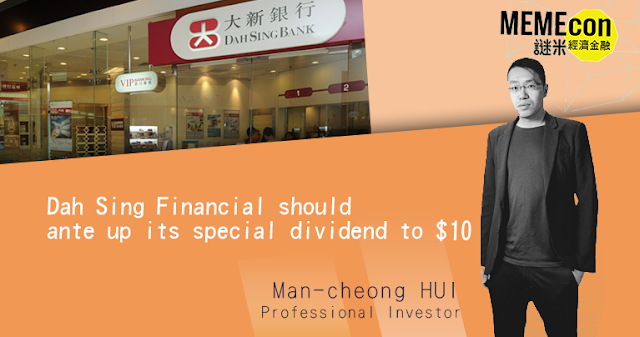 Lately, Dah Sing Banking fast approached its 52-week high, reaching out for $16.00 and above. This way its tangible price-to-book value is equivalent to as high as 1 times, with its return on equity is now almost as much as 10%. Having said that, I believe that the Group is undoubtedly a good candidate for restructuring, or a potential merge and acquisition target in the foreseeable future, given that this sizable bank of Hong Kong is still much undervalued. 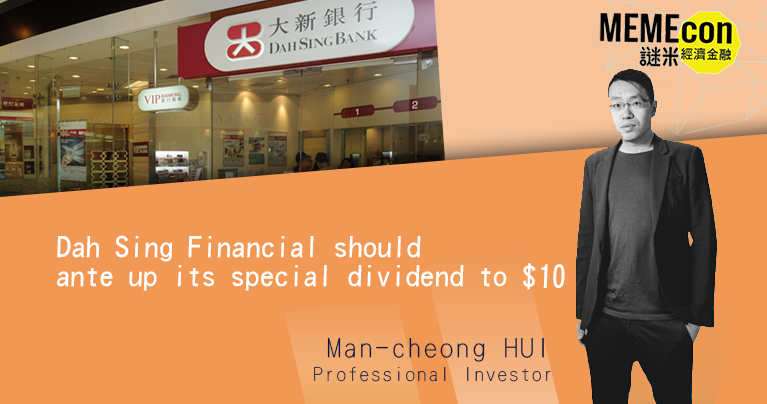 At the same time, Dah Sing Financial is going to finish the Dah Sing Life deal, to be followed by a special dividend distribution. 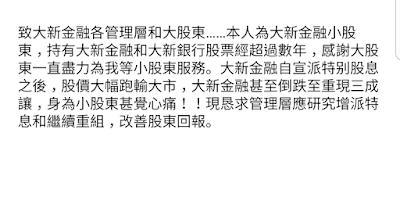 *Man-cheong HUI is the founder of Godahsing.com. 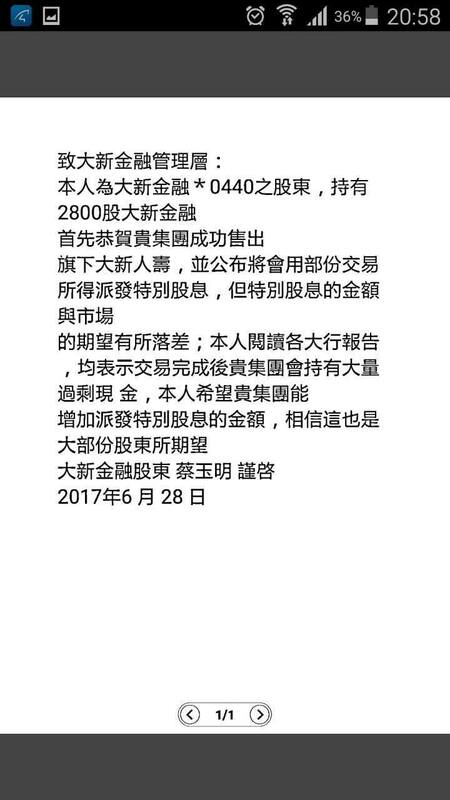 HUI has had holdings in the shares of the aforesaid companies. Dah Sing Financial: Following discussion between the Parties in accordance with this provision, it has been agreed that the Long Stop Date shall be extended to 2 September 2017. Save as disclosed above, the terms and conditions of the Share Sale Agreement remain unchanged. HNA’s holding in Germany’s biggest bank rose to 9.92 percent, according to a regulatory filing Tuesday by investment entities acting on HNA’s behalf. The conglomerate initially reported a 3 percent stake in Deutsche Bank in February, saying at the time that it may increase its holding, while intending to remain below 10 percent. It disclosed a stake of almost 4.8 percent in March. 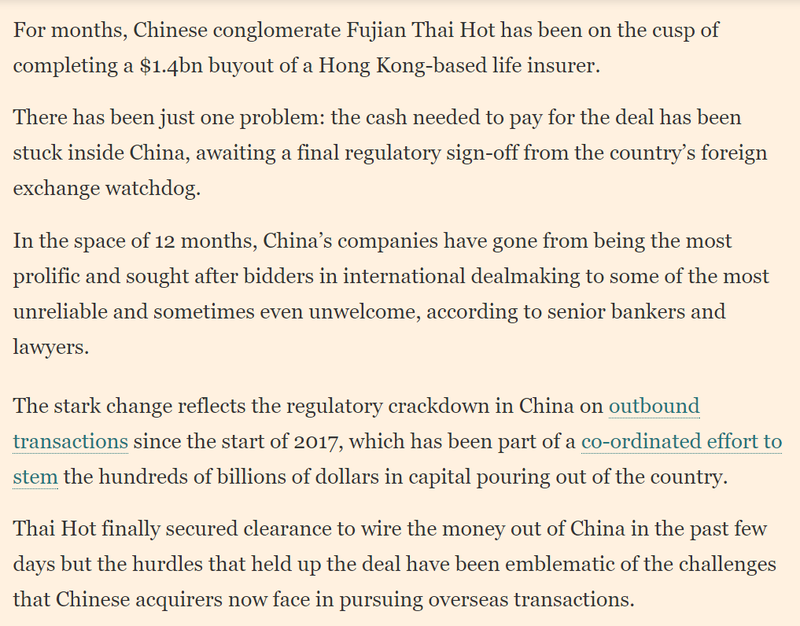 For months, Chinese conglomerate Fujian Thai Hot has been on the cusp of completing a $1.4bn buyout of a Hong Kong-based life insurer. 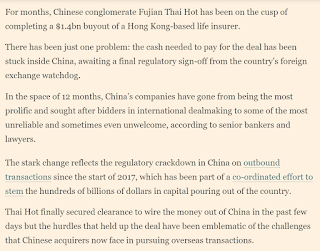 There has been just one problem: the cash needed to pay for the deal has been stuck inside China, awaiting a final regulatory sign-off from the country’s foreign exchange watchdog. 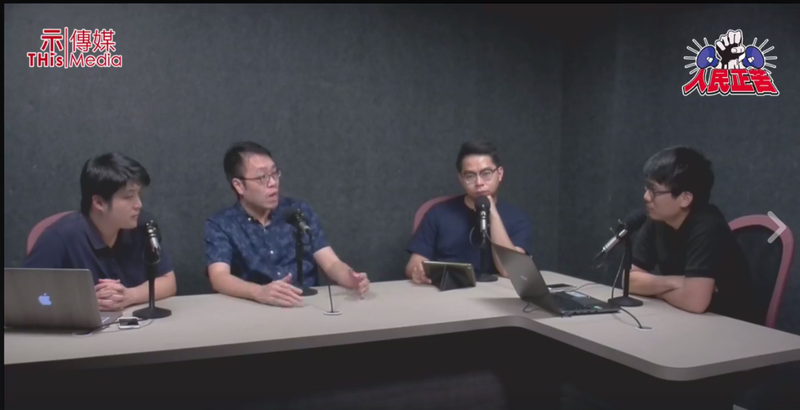 Thai Hot finally secured clearance to wire the money out of China in the past few days but the hurdles that held up the deal have been emblematic of the challenges that Chinese acquirers now face in pursuing overseas transactions. Shares in Hong Kong-listed Jilin Jiutai Rural Commercial Bank fell 8.7 per cent on Monday after Chinese financial media outlet Caixin said it was Huishan’s second-largest creditor, among a string of other lenders including HSBC, China Citic and Hang Seng Bank. NCDs initially offered banks the attractions of low cost and no collateral requirements, but since October the average cost of issuing the AA-rated three-month NCDs has risen to 4.72% from 2.90%—in some cases exceeding yields on AA-rated one-year corporate bonds. 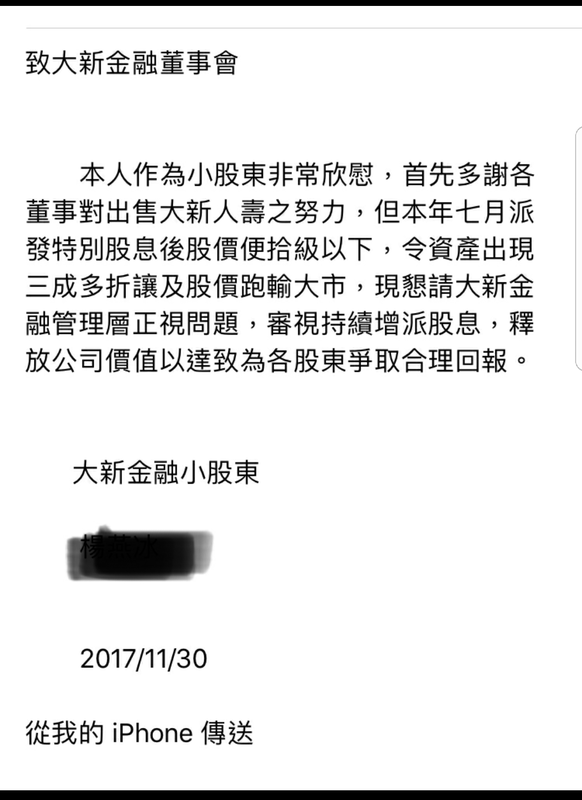 The rating action reflects expectations of a more challenging operating environment for banks in Hong Kong, Moody’s noted. 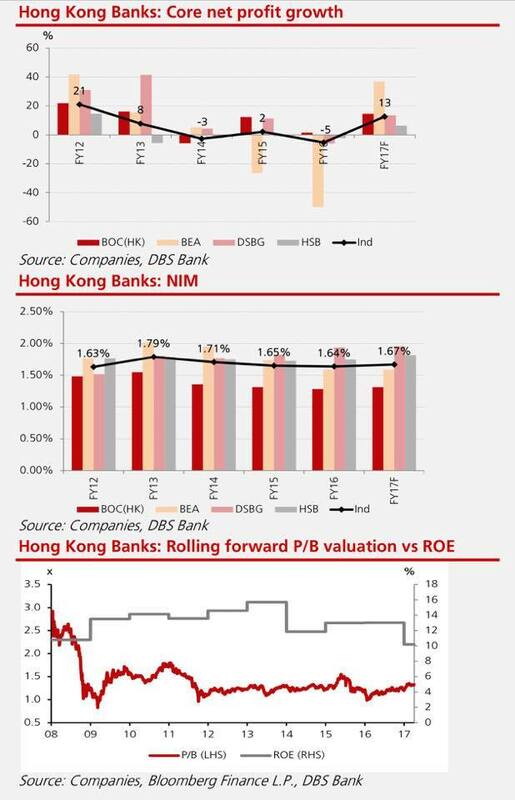 These three banks' current impaired loan ratios are exceptionally low at below 0.6 percent, due to benign operating conditions in Hong Kong since the global financial crisis. However, the expected deterioration in operating conditions will likely lead them to report increases in impaired loans in coming years, Moody’s said. Deutsche Bank AG said Sunday it will seek to raise €8 billion ($8.5 billion) through a share sale, a move aimed at shoring up the German lender’s capital less than two years into a major restructuring under Chief Executive John Cryan. It is keeping the Postbank retail-banking business in Germany it had sought for two years to sell. And it is recombining its corporate-finance and deal-advisory business with its sprawling trading unit, following a costly move to split them in late 2015.